Food, by its very sensory nature, is incredibly linked to our memories. For author Charmaine Chan, popiah, pandan cake and tah mee pok always have the power to draw her back to precious moments with her sisters whilst growing up. 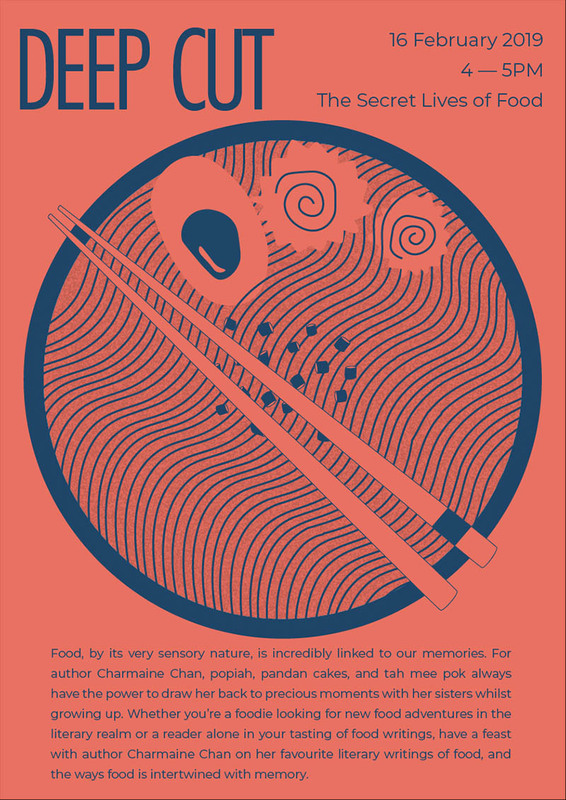 Whether you're a foodie looking for new food adventures in the literary realm or a reader alone in your tasting of food writings, have a feast with author Charmaine Chan on her favourite literary writings of food, and the ways food is intertwined with memory. Inspired by the term deep cut—used in the music industry to refer to the b-sides or songs of an artist that are not well known or conventionally played—this year-long series explores both unconventional intersections in literature and the little-known sides to authors. Our venue partner, Littered with Books, is an independent bookseller in Duxton housing a range of carefully curated literary books! Charmaine Chan is a writer, journalist, editor, poet and former lawyer from Singapore. An inveterate globetrotter, she has lived, studied and worked around the world, from London to Hong Kong, Guam to Shanghai. Her work has appeared in Her World, The Peak and Prestige. Her poetry was featured in the bestselling anthology, No Other City: the Ethos Anthology of Urban Poetry. The Magic Circle, a creative non-fiction work, is her first full-length work.